OnePlus Bullets Wireless review | What Hi-Fi? Truly wireless headphones that deliver truly good performance are few and far between – and they're almost non-existent for less than £100. The OnePlus Bullets Wireless aren’t truly wireless, of course – the buds are connected to a lightweight rubber yoke that goes around your neck – but they do come in at just £69. As such they're well worth consideration - with just one important caveat. The Bullets Wireless follow a familiar neckband design, similar to that of the Beats X earbuds or Sennheiser’s Momentum In-ear Wireless. The band houses the battery, which provides a claimed eight hours of continuous music playback, and there's an integrated mic with control buttons for volume, call answering etc attached to the left-ear cable. The lightweight neckband never draws attention to itself, as long as you have it directly on your neck. It does occasionally drag on your shirt collar, though - the cables aren’t especially long. 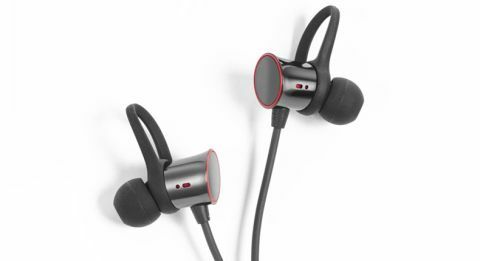 When not in your ears, the buds clamp together magnetically – the process cuts off power at the same time. If they’re not stuck together, power shuts down automatically after a few minutes if there’s no music playing through them - so they won’t just run themselves down if they come apart in your bag. With the earphones you get three sets of earbuds of differing sizes, three sets of wings to help maintain stability of fit for the buds in your ears, a USB charging cable and a small rubberised pouch for housing the headphones when they’re not around your neck. This last item is a bit of a letdown, though – it’s just too hard to get the headphones in neatly while still being able to close the mouth of the pouch properly. We can’t imagine using it too often. Having removed the Bullets from the box, made sure they’re fully charged and connected via Bluetooth (a simple enough process), we sort out a suitable fit so we can start testing in earnest. And that’s where our main issue with these headphones becomes apparent. For many of the What Hi-Fi? review team, even the largest buds supplied don’t provide an effective in-ear seal. As with all headphones of this type, a good fit is vital if you want to get anything even approaching decent sound. Without it, bass is pretty much non-existent and everything you hear comes across as remarkably thin and tinny. Without a proper fit, it's hard to give a fair appraisal of the product. We eventually cannibalise some buds from another set of in-ears and are able to proceed – but it’s not something anyone purchasing these headphones should have to do. It’s the first time we can recall having this problem with the largest set of buds provided with a pair of in-ears and, while it may not be a problem for some, it’s something to bear in mind. Once the Bullets are securely in place with a decent seal, they do a good job – especially taking that £69 price into consideration. The sound is detailed and expressive, with good dynamics and pace to a track. They are reasonably even across the frequencies, although there’s a bit of a peak to their response in the upper midrange. It never quite veers into stridency, so the listen is always comfortable if not the most subtle. Bass is reasonably tight and snappy, without the overly booming sound of some budget options. This general evenness of tone means the musical strands of Roxy Music's If There Is Something tie together well, and the Bullets remain consistent throughout. They can’t compete sonically with the likes of the Sennheiser Momentums – while their sound is fast and agile, timing is an issue, with complex rhythms occasionally tripping them up – but they are comfortably less than half the price of the Momentums, and on that basis alone have a great deal going for them. Using them out and about every day, we are reasonably impressed. The Bluetooth connection is stable, and we have no problem connecting to our phone while listening to podcasts or Spotify on our daily commute. The inline mic and controls work well, and we find ourselves comfortable with the general set-up after only a day or so of use. MORE: Apple Music v Spotify - which is better? The OnePlus Bullets Wireless are a solid option for those after the convenience of wireless headphones. While they’re not perfect, they are sonically competent – and the next step up from here is the Sennheiser Momentums at £170, so you’re getting a lot for your money. And they are easy to live with. All of which is irrelevant, of course, if you can’t get them to fit. So take care to ensure you can get a good seal for the buds in your ears before you invest. Tick that box and the OnePlus Bullets Wireless offer fine value for money.